You just walked into work on a typical Monday, cranky and tired from marathoning Mel Brooks movies until 1am. That’s when you see IT: a box of donuts sitting open in the break room, a beacon of glaze and rainbow sprinkles. Your morning instantly becomes bearable as you fish out an apple fritter and let out a little Homer Simpson drool. 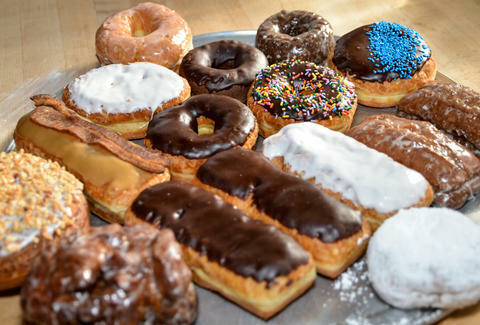 Your day is now much improved thanks to a box of donuts, most likely from one of these seven great MKE spots. Did someone say bacon? If you're the kind of person that like salty and sweet combos and puts bacon on everything, then the maple bacon long john at Cranky Al's is your jam. 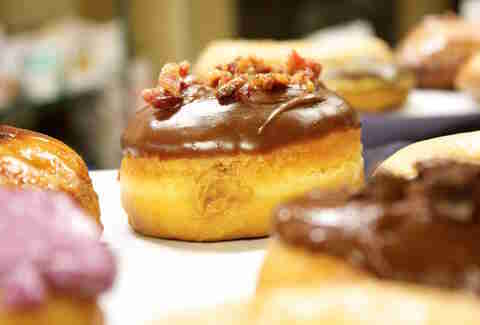 If you're more of a traditionalist, there's plenty of yeasted and cake donuts to choose from. Come back for dinner when they turn out some tasty pizzas. 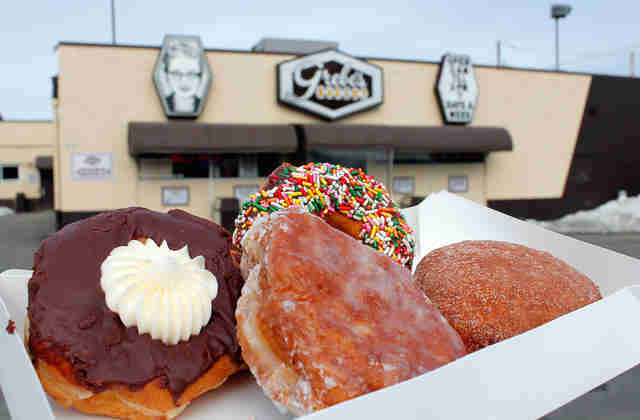 One of the oldest bakeries around, Grebe's has been frying donuts and baking hardrolls since 1937. 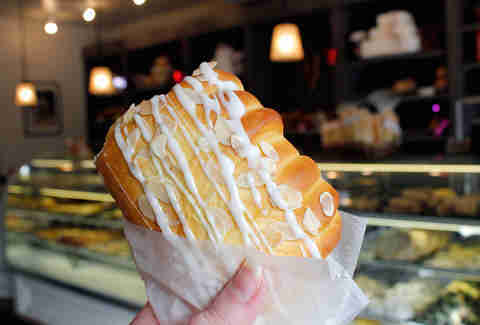 Their cruller, a dense cake-like glazed bar donut, is so popular that they also sell bags of baby crullers for sharing. If you're in on Sunday morning, get in line for hot ham and rolls along with your donuts; it's a Milwaukee tradition. Holy Moley puts unique flavors into their donuts, like passion fruit, violet, and pistachio. S'mores and peanut butter-chocolate-bacon are two of the most popular flavors, though you can get an old fashioned chocolate cake donut if you insist. This is a great place for vegan and gluten-free diners, but get there early, because all the donuts sell out fast. Though National Bakery makes all kinds of tasty donuts year round, the big draw are paczki on Mardi Gras -- or, as it's known in Milwaukee, paczki day. The Polish donut was traditionally made the day before Lent to use up all the butter and lard in the house before fasting until Easter. People start getting in line for paczki well before the bakery opens, and they will sell out all 45,000 of them. The old timers favor traditional prune-filled, but raspberry and raisin are available if you're already sufficiently regular. Skip the chains and head to a Honeydip instead. They stock all the usual favorite varieties fresh throughout the day, and at the 24/7 locations, all night long, too. They've been neighborhood staples for decades, so the decor walks that precarious line between dingy and retro, but the donuts always satisfy that sweet tooth and that's really all that matters. Donuts go fast at this Italian bakery, so you might have to choose an almond bear claw or eclair instead, which probably have spots somewhere in the great donut pantheon. 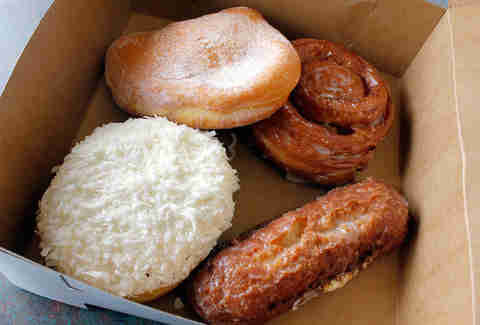 But whatever donut you pick, from jelly filled to cruller, it will be soft and fresh. Don't bother trying to ignore the Italian cookies, you'll need a pound of those, too. This place is -- you guessed it -- a drive through, and a drive through only. Mini donuts are all that's offered, but you get to choose whether you want them shaken in powdered sugar, cinnamon sugar or both. These little guys are addictive so buy them by the dozen, or else you might not have any for yourself once your coworkers get a whiff. Lacey Muszynski is a Milwaukee native who has never waited in line on paczki day but always seems to get herself a paczek one way or another anyway. Follow her on Twitter @worthhersalt.